I purchased some Strathmore Bristol (vellum surface) 400 series, for the first time, which is not quite so readily available in Europe. It does state it is not suitable for watercolours, but I thought I’d try it with just a few washes. 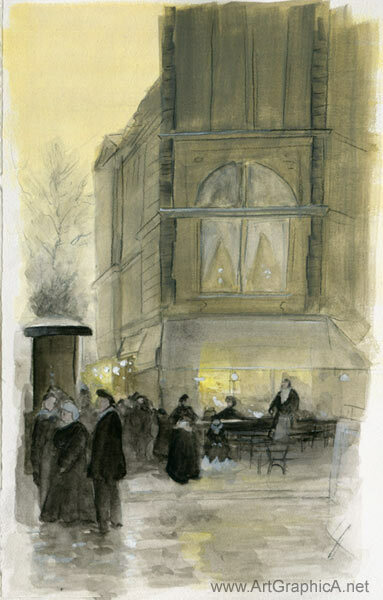 This 18cm by 10cm sketch is from a section of a Luigi Loir painting set in Paris. I used Winsor & Newton designer gouache (permanent yellow deep, yellow ochre, ivory black and zinc white), and just a touch of Daler-Rowney watercolour. I’ve only used gouache a couple of times before today, but I’m starting to enjoy it. Incidentally, Luigi Loir was a master with gouache. I watered down the paint for the most part so that the pencil shows through. Where the opaqueness of the gouache covered the pencil too much, I touched things up a little with a Wolff’s carbon pencil. The paper took the watercolour and gouache washes quite well. If you mess about too much, it does pull the paint off a bit, but for sketching and simple washes it’s a nice resilient paper with very little in the way of texture.